Eight years later, and Serena Williams and Justine Henin are still looking for closure. Well that “someone’’ Williams could not bring herself to name was Henin. And if Williams were truly interested in finding out if Henin had fessed up to what happened at the 2003 French Open, the infamous Hand Incident, then Williams could have just googled it. Instead, she wrote it in a question with very pointed words to her two million Twitter followers, including media members who would make those words even more public. So this was about sending a message. For some reason, Henin did talk about it, and other controversial moments in her career, in a TV interview in Belgium. She is acknowledging wrong-doing in several things, possibly for closure, while taking a slow exit from the stage since retiring last month. I’ll get into the specifics in a minute. But this is an amazing example of how a small, somewhat insignificant moment can escalate over the years, blow up into hard feelings and rivalry and probably even hatred. It all shows in the fact that both of them still feel the need to talk about it now. In Henin’s case, I assume it has been eating at her. I wouldn’t say she cheated exactly, to use Williams’ word, but what she did was provide a shocking example of terrible sportsmanship. It would define her in several ways for the rest of her career. 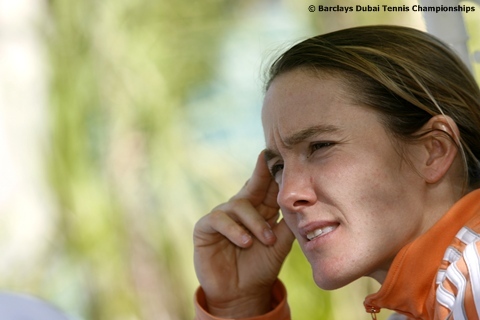 Will Justine Henin Find What She’s Looking For? What I remember best about Justine Henin at the Australian Open in 2010, when she was starting her comeback, was the freshness, the beauty. Her backhand and artistic style were always special. But her thoughts, her words were poetic. She was so deeply introspective about herself and her two years away from the game. Before that, honestly, she had not always been overly likeable. But now, just one year later, she has left the game again, citing a torn elbow ligament. Earlier this week, she said she was “in mourning” about it, that it felt like a sentence. Is it still there? Can she rely on it for the rest of her life? When Henin retired the first time, as the best player in the world about to go into her best tournament, the French Open, people couldn’t understand. This retirement is seen as much more natural. I don’t know. This one seems awkward to me. Her quotes don’t add up. Her thoughts aren’t fluid or poetic. Her timing is odd. What I’m saying is this: I wonder if Henin is lost. And maybe she has been all along. We’ve seen so many athletes who don’t know what to do with themselves when their playing days are up. They’re still young, with a lot of time to go. But their goals reached, and no clue about what other mountains to climb. Henin is just 28. And now she is off into the big world to do what exactly? I doubt she knows.